Buckeye Valley Locals Schools will take possession of the property and old house at 530 E. Main St., Ashley, formerly known as the Haunted Hoorah Halloween attraction, on Thursday, May 17. According to school officials, several assessments need to be taken before the old house can be demolished. The Buckeye Valley Local School District will take possession of the Haunted Hoorah property at 530 E. Main St., Ashley, on Thursday, May 17. 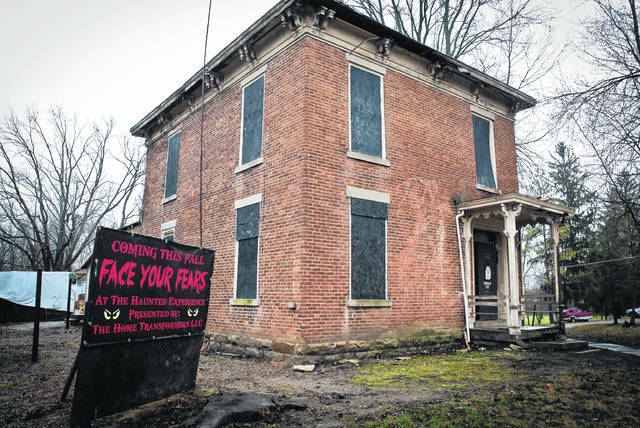 “There is no set date to my knowledge for the demolition of the haunted house,” said Andy Miller, Buckeye Valley Local School District superintendent. Before demolition can take place of the old farmhouse, Miller said a number of assessments will need to be taken of the property. He said one of the assessments will be to check for the amount of asbestos contained in the building or on the property. Miller said Tuesday in a phone interview that having access to the house and that part of the property isn’t a high priority. He said the only part of the property the district needs access to right away to stay on schedule with its construction project is the northwest corner, which will allow the district to continue the buildout of the new building. Where the house sits now is to be the new bus loop. Brent Stooksbury, the owner of the Haunted Hoorah, said all of the props and equipment for the haunt have been removed from the building and put into storage. He said Delaware County Common Pleas Court Judge David Gormley gave them some extra time to get everything out before the school district took possession of the property. During the trial, Stooksbury was asked to leave all the Haunted Hoorah props up so the jury could tour the property before testimony was given. “We had to leave the house set up for the jury,” Stooksbury said in an earlier report. The Buckeye Valley Local School District Board of Education (BOE) was ordered to pay Stooksbury $229,000 for the property in a jury trial that concluded on March 28. After the trial, the BOE — in a letter from its attorney — ordered Stooksbury to vacate the property by May 1. Attorneys for Stooksbury then requested for a status conference to deal with the matter. Stooksbury said he is looking for a new location for the Haunted Hoorah, which has forced him to put the attraction on hold for a year. Stooksbury added the $229,000 for the property was just released. He said he needs to find something at least by January or February in order to be ready for the 2019 season. He said he wanted to stay close to Ashley because he has built up such a large clientele over the past five years. Contact D. Anthony Botkin at 740-413-0902 or follow him on Twitter @dabotkin. This entry was tagged Buckeye Valley, D. Anthony Botkin, delaware county, Gormley, Miller, Stooksbury. Bookmark the permalink.